PES 2012 UK Release Date: October 14th! Konami have announced that PES 2012 will be released in the UK on October 14th. Here is the official press release, from Konami. Konami Digital Entertainment GmbH has announced it will unleash its eagerly-awaited PES 2012 title on October 14th for PlayStation®3, Xbox 360® and Windows PC, stating it is the most ambitious and advanced football experience ever. PES 2012 goes further in giving the user total control than any other football title, offering AI innovations and gameplay additions that cover every aspect of real football. 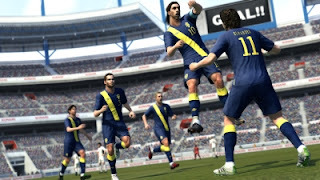 Central to PES 2012 is the all-new Active AI system which ensures that teammates work to close down space, defend zonally and hold their line to minimise attacking options. As such, as players defend, their colleagues will look to hold the defensive line and mark oncoming offensive support. Conversely, when attacking, the player will see that their teammates will make dummy runs, draw defenders, and work to give the player more options in attack. Furthermore, the emphasis on the team as a unit is demonstrated with PES 2012’s ground-breaking Teammate Control system – a truly unique addition which allows the user to control two players at once, prompting runs or drawing defenders with one, while the other holds the ball up. Teammate Control works in two ways; with users pressing the right analogue stick in the direction of the player they wish to control. Support play is offered in Assisted mode wherein users prompt a second player to make a timed run to cut inside or receive a ball, while total control is afforded by the fully Manual mode which gives the user complete freedom of movement of the second player. Elsewhere, PES 2012 is equally full of new additions. Animation has been enhanced, while the overall presentation has also been refined. Managers can now be seen wandering the touchline, while the general atmosphere of a big-match day has been faithfully recreated. In terms of gameplay, shooting movement and reactions are much improved, control is no longer totally lost when losing possession of the ball, a return to the classic ‘behind player’ penalty system, and one-on-one situations offer greater control as defenders press and jostle to win the ball, and attackers use upper body feints and movements to bypass and wrong-foot their man. PES 2012 also continues KONAMI’s close relationship with UEFA that sees the PES series as the exclusive home of the UEFA Champions League™, UEFA Europa League™ and UEFA Super Cup™ video game licences. Attention to detail within these key tournaments has been extended to the match officials, and PES 2012 will see referees and their assistants now sporting the official UEFA Champions League™ uniforms. KONAMI will detail the release dates for Wii, PlayStation®2 and PSP® (PlayStation®Portable) versions of PES 2012 shortly. We'd like to stress that October 14th is not the worldwide release date for PES 2012. Like usual, some countries will be receiving their copies earlier than the UK. We can also confirm that, like this year, PES 2012 will be using the same BLES code format. Credit goes to WENB for giving us the heads up.